This was the only day that did not begin with a long hill to climb. 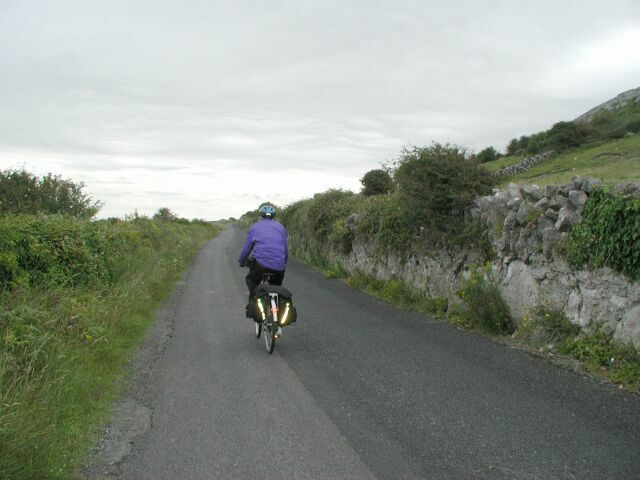 In fact, the entire route around the bay from Ballyvaughan to Galway was relatively flat. After the spectacular scenery of the Cliffs of Moher and the rocky landscape of the Burren, this last day was quite ordinary. We started off biking eastward along the bay, but after a few miles the road made a “V” towards the south around an inlet. Biking along the first arm of the “V” I felt the wind in my face and an added burden on pedaling. It was one of the few times on the trip that I was aware of the wind at all. That probably means we had it at our backs the rest of the time, but I doubt that it was ever very strong. Coming back towards the bay on the other arm of the “V” we passed a herd of cows, and as we stopped to take a picture a boy and a dog started to herd the cows across the road to a field on the other side. I was intrigued at how the boy and the dog were able to control these big dumb animals. Mostly, the dog did the work, and the cows seemed to know what was expected of them. Obviously they had done this trip many times before, but they had to learn sometime. Being a city boy, I don’t understand how to work cows. At the end of the “V”, instead of following the main road along the bay, we continued northward for a detour that I had marked on the map in order to avoid a big hill that loomed on our right. It turned out to be a very rural path, and for the next 15 minutes we saw no other traffic. 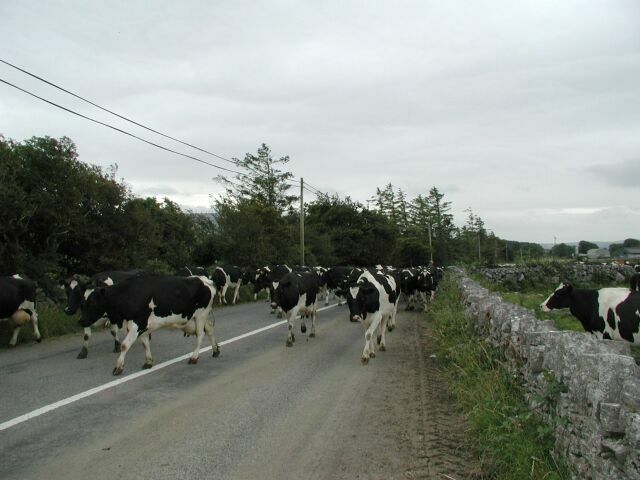 Once again, however, we encountered a small herd of cows being led along the road by a farmer. 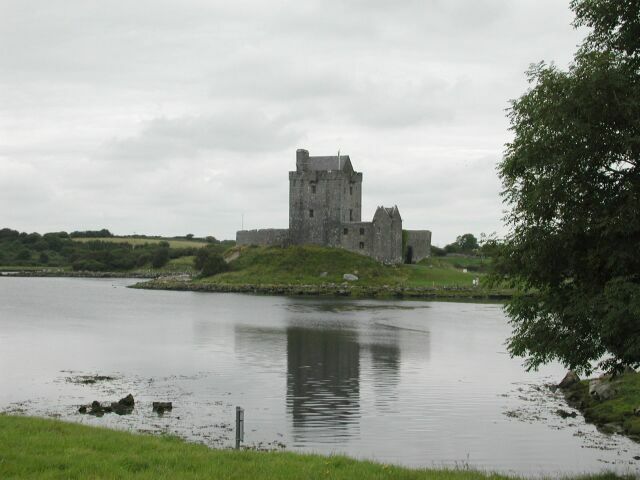 About seven miles further along the main road we entered the town of Kinvara, where there was a small port and a castle. That’s Len on the right, walking back from the small port on the inlet. The castle was just up the road to the right on the other side of the water. We parked our bikes inside the castle walls and paid the admission fee to walk up the four floors of the narrow castle. Each floor had the equivalent of two rooms, and some of them were modestly furnished. History placards told us that the castle had actually been occupied until recent years. I think it was the mayor of the town who had lived there, and the furnishings purported to be those that he used. It looked pretty austere and unfriendly to me, but I was thinking that it would be neat to say that you lived in a castle. At present it is being rented out for catered dinners. On the top floor of the castle was a small entrance that gave onto an exceedingly narrow walk around the outside perimeter. I squeezed out, and despaired of fitting past the turns with my handlebar bag. But I persevered, and walked around the castle to get the view from each quadrant. 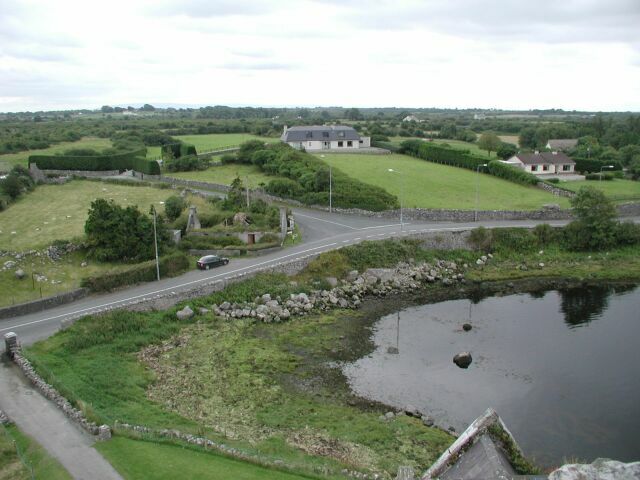 I include one of the pictures below, showing the road that we would take towards Galway. On the other side there was a view of the water with a flotilla of swans that were probably obligatory for any self-respecting castle to possess. The visit to the castle marked the end of bike touring for us. 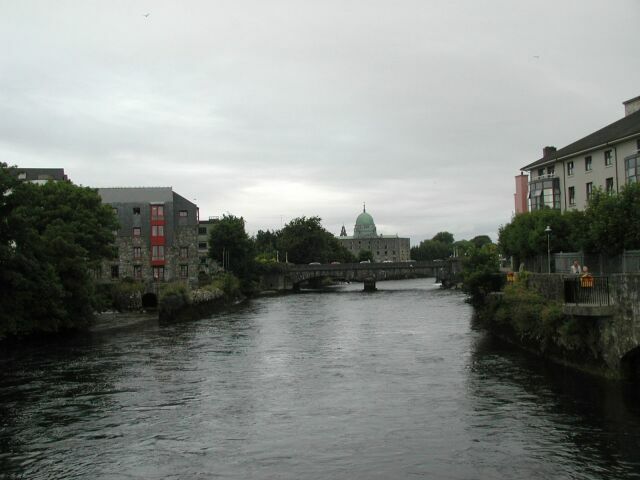 From here to Galway, perhaps another 16 miles, it was just a question of joining roads that were bigger and bigger tributaries joining the growing traffic into the city. Just before joining a four-lane highway, we stopped for lunch at a food market. In previous days we hadn’t had much luck in finding good snacks at such places, but this was our last chance. After some deliberation, we got some apple tarts, a cake roll, and a couple of orange drinks, and we sat on a plank at the side of the parking lot to eat. I took a bike of an apple tart, and decided that the cake roll would have to do. Then I tried the cake roll, and it was awful enough that I tried to wash it down with the orange drink, which was terrible itself. By unspoken agreement, both Len and I threw away everything we had bought, and rejoined the highway towards Galway. The biking was easy and we made good time riding on a wide shoulder of the busy highway. However, scenic it wasn’t. I just followed the moving arrow on my GPS and fixed on the decreasing mileage to Galway. About five miles outside the city the road became a divided highway, and we decided that would be unsafe for us, so we turned off onto another main road that followed the water around the bay to Galway. Along this road I saw quite a few bed-and-breakfasts, all with vacancy signs. In fact, during the entire trip it seemed that every place we visited had many vacancies. You never know about these things, but we probably could have done without reservations. I’d have worried, however, and that counts a lot. Len was doing his usual marvelous job of navigating into the city so as to approach our hotel directly. He never failed, and I looked at him as a sort of air traffic controller, lining up the planes on the runway for final approach. The traffic became heavy, and there were several difficult roundabouts. Len pretended that he was a car, and entered them fearlessly amidst all the traffic, while I waited futilely for some break in the traffic that never seemed to come. After the last of these torturous roundabouts, we seemed to divide off from the main traffic, and biked up a long hill. Coming over the top we suddenly arrived at Eire Square, the center of Galway and the location of our hotel. Len had done it again! Len must have sensed something about the nature of this question, because he replied, “It doesn’t matter; we’ve already paid.” Of course, that wasn’t true, but it avoided the dialog that probably would have followed. The man turned his head away from us. “Ask someone else,” he said curtly. Len and I looked at each other. Well, if that wasn’t something! In this whole country everyone had been so extraordinarily friendly to us until this moment. The man had been standing only a hundred feet from our hotel, but refused to guide us there. 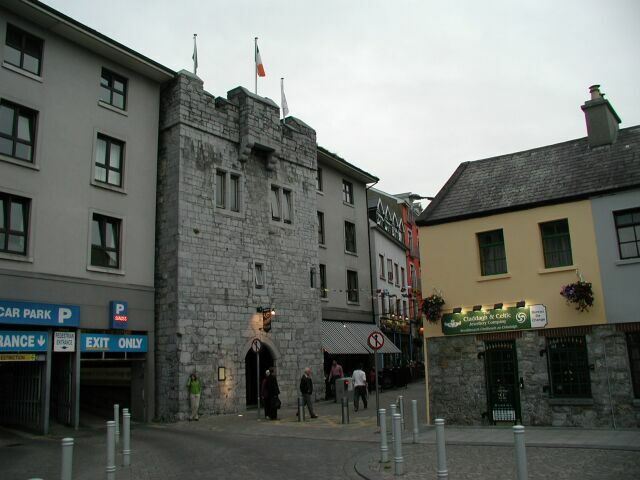 A little later, in my hotel room, I was reading my guidebook about Galway, and it said that you should stay away from the hotel touts that stood in front of the railway station. We circumnavigated the square, walking our bikes through the crowds and looking for our hotel, but with no success. I was thinking now that I was wrong before. Even when you’re at the square where the hotel is located, sometimes it’s hard to find. Eventually someone else showed us down a side street where we found our hotel. It really wasn’t on Eire Square at all, but they obviously liked to advertise that they were. So far we had been singularly unimpressed with Galway. Unlike every other place we had visited, it seemed to have no charm at all. 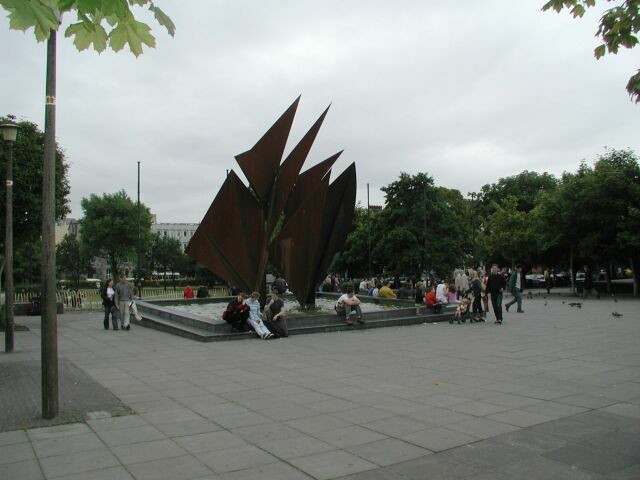 Eire Square itself had few redeeming features, and I saw nothing around the square that looked the least bit promising. At the reception desk of the hotel Len said that he had been promised a room with a view of the square. “We don’t have views,” the woman at the desk said. “But I was promised one,” Len complained.” “We don’t have views,” the woman reiterated. When I finally did get my room, she was proved right. My window looked out onto a dingy airshaft, and I doubt that anyone else had much of a view either. I did have a little trouble getting my room. I was given the key to a room on the fourth floor, and I lugged my stuff up there, unlocked the door, and found an unmade bed and a dirty bathroom. I found a maid outside, and asked her about my room. She seemed exasperated with me for being given a room that wasn’t ready. So far Galway was striking out. 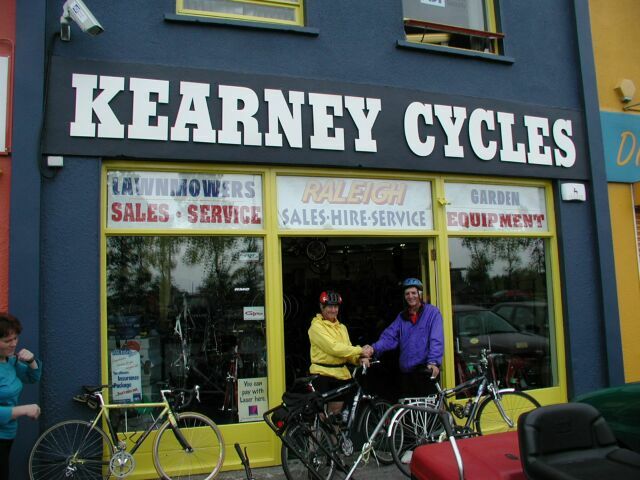 First things first, and now was the time to return our bikes to the shop in Galway before it closed. We retrieved the bikes from the incredible storage space where they had been put next to the hotel, and walked them back through the square to the north. Then we biked a few blocks in traffic to join one of the main roads north out of the city. The bike shop was located in a shopping mall along this highway. The short trip there continued the Galway nightmare. Traffic was horrendous, and the shopping mall was located near the intersection of two extremely busy four-lane highways. There were two roundabouts, traffic lights, a McDonalds, industrial plants, and a large shopping mall. To make matters worse, the mall was on the right, meaning we had to get across the four lanes of traffic. This wasn’t a place meant for bikes or pedestrians. It was car city, and it was the worst of America, right here in Ireland. The last roundabout almost finished Len off. In the midst of traffic he pushed out into the road, and suddenly found himself in the middle of chaos with cars honking and stopping all around him. I thought he was going to be run over. Later he explained that he believed he would be shielded by a turning car. But that car had veered off, leaving him exposed to everyone else. Anyway, we were there, and with relief biked into the entrance road of the mall, where we could see the bike store on the left. For the first time that day it began to rain as we set up for the final biking picture outside the shop. No matter – we were impervious, and we took this picture to celebrate our successful and wonderful trip. Inside the bike shop, I expected to be greeted effusively – like, wow, you got here from Cork? But instead we couldn’t even get anyone’s attention. Finally, we waylaid a salesman and pointed to our bikes. “Oh, just leave them there,” he said, gesturing ambiguously to the side. “Don’t you want our names or anything?” I asked, but he had already turned away. We put all of the accessories in the panniers, and turned to leave. Then Len persuaded me that we should at least get someone to sign our rental agreement. So I asked, and the man scribbled something. Later I saw that he hadn’t even signed his name. He did mention that a truck would be coming the next day, and would collect all the bikes. I just felt the profound indifference, and even when Len tried to tell the man that the back tire on my bike leaked (I’d had to pump it up every day), he was dismissive. “Oh, they’ll see that,” he said. Not likely, I thought. We walked the mile back to our hotel, eating ice cream cones on the way. 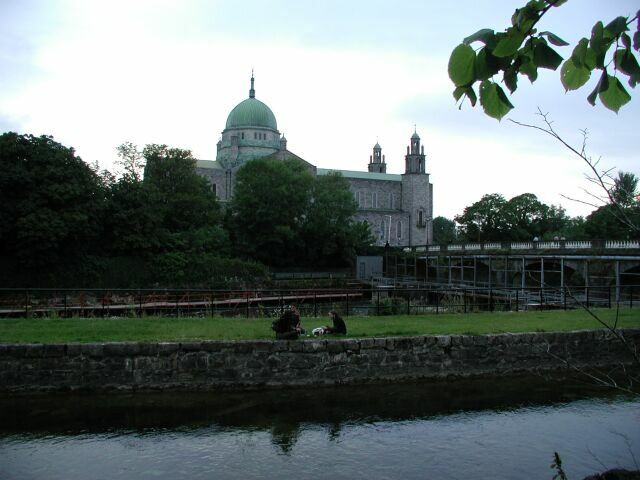 There was nothing interesting to see, and when we reached Eire Square I looked around for some picture that I could take of Galway. I couldn’t find much. This picture flatters the square. After a short rest we asked at the desk about where we might find a good restaurant, and were directed to a pedestrian street that led to the quay on the river. 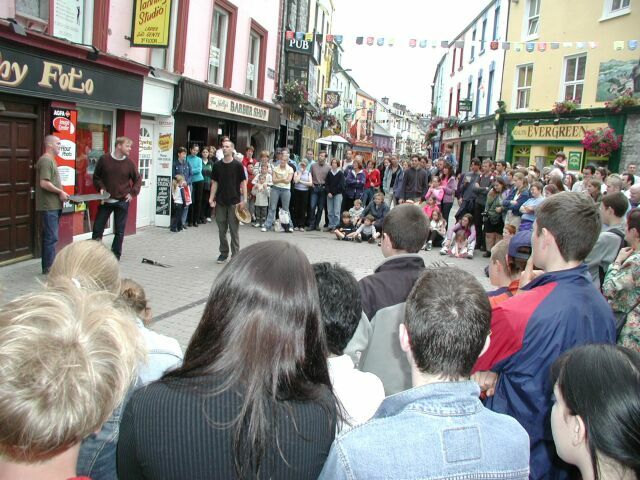 This pedestrian mall started off a different direction from Eire Square than we had been before, and immediately the town began to look much better. There were big crowds on the street, interesting upscale stores, and a number of impromptu entertainers. The street, as you can see, was full of life. Near the end of the street we found a restaurant recommended as the best. 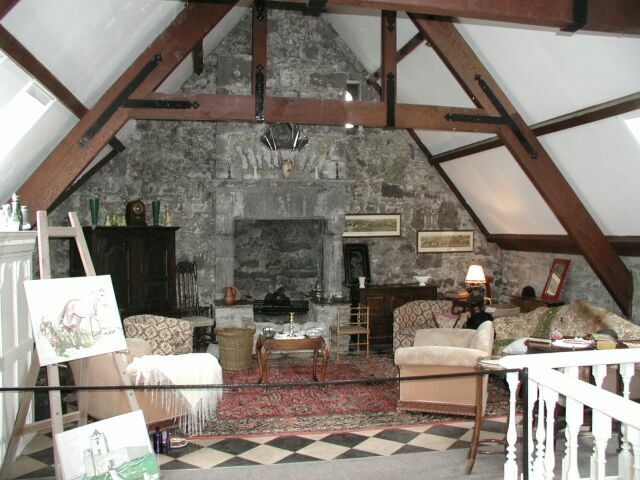 It was housed in a small castle, and even at this early hour was full. We got one of the last tables, and enjoyed an excellent meal. After dinner we walked to the river and saw a large cathedral a few blocks away. There was a path on the right side of the river, and it was a very pleasant stroll in the waning light. We walked to St. Nicholas’ Cathedral, but found it locked for the evening. Walking back along the river I was fascinated with the system of small locks and waterfalls that led small parallel streams into the main flow. The water looked cold and dark, and the stream was obviously very powerful. I imagined falling in and being swept away, for it would have been impossible to fight that current. We saw several picnics, students studying, and quite a few fishermen. Len asked one of the fishermen what he could catch, and was told that they fished for salmon, which swam upstream here to spawn. I was impressed that they could struggle against this current, and thought about the tremendous biological drive that compelled them to this ultimately fatal ordeal. Galway had been growing on us. There was indeed life and beauty here; we had simply been in the wrong place to appreciate this earlier in the day. 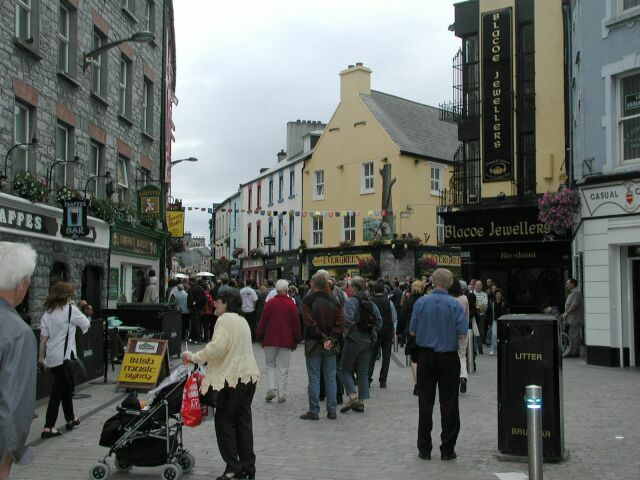 Now we walked back along the pedestrian mall and surveyed the pubs. 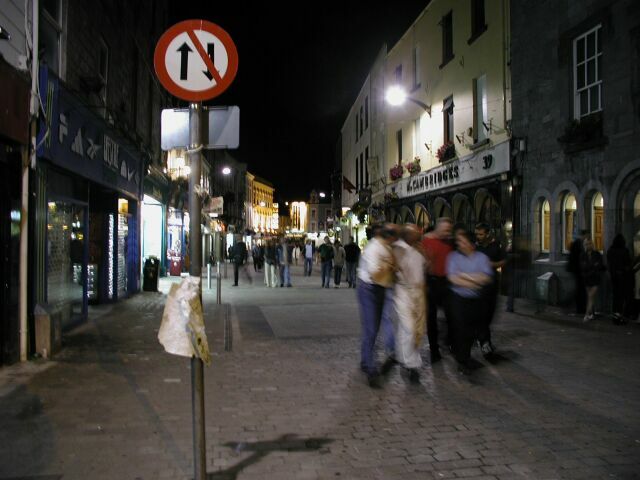 Here in Galway there were many to choose from, but they were on a different scale than those we had experienced in the smaller towns. Not only were the pubs larger, but also they seemed to feature more prominent bands, and many charged an admission fee – quite a different proposition than the quaint pubs in the rural areas. Len consulted with one of the bouncers that fronted a large pub, and we decided to enter. We stood at the far end of the bar, nearly against the stage where a four-man band was warming up. The lead singer was kissing a young girl, and I watched her turn away and roll a cigarette from the contents of a green package. At the time I thought she was using marijuana, but later that night and the next day on the train I saw several other young girls roll cigarettes from identical packages. A tough looking man was standing next to Len, and as the band began to play he taunted the lead singer, waving a wet towel. I couldn’t understand what his problem was, but Len and I sensed the possibility of a brawl. After several minutes of taunting, the man threw the wet towel at the face of the lead singer. I was sure something would happen, but the singer was very cool, saying an aside to the rest of the band to keep playing, and that the pub would take care of the problem. When next I turned, the man had disappeared. We walked out into the night, where the street was still very active and full of potential happenings. We had reached the hotel elevator. Our rooms were on different floors, and Len had an early train to Dublin. I would be on a later one, so this was the end of our wonderful adventure. We shook hands and said goodbye to Ireland.